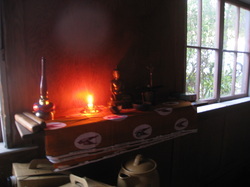 The Wind-in-Grass ("WiG") Sangha is a Zen community that meets in Potrero Hill every Wednesday night. WiG was formed in October of 2009, and is open to everyone without exception. 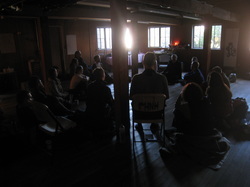 Our practice focuses on 25 minutes of seated meditation ("zazen") an evening, and compliments each meeting with presentations, talks from local Zen teachers, and/or the discussion of teaching stories ("koans"). Our process is awakening through giving loving attention to the present moment no matter what that holds. Even the hard parts. And in being present, really present without judgment or aversion, we begin to see reality; perhaps for the first time. We observe that our suffering is not caused by the world around us but by our own limiting beliefs. The result is space, peace, joy, and choice in how we respond to life. 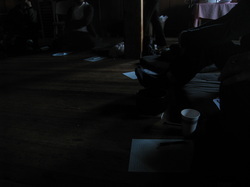 Our practice of zazen and koan training is not aimed at calming the mind or finding peace, though those are common byproducts as we learn to accept what arises. It is aimed at awakening to the world of which you are part. It is not an easy practice. It will likely be the hardest thing that you have ever done, and if there is anything else you would rather be doing, we recommend you investigate that first, but zen is the most rewarding endeavor that we have ever encountered. 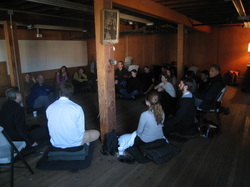 2nd Wednesday: An inquiry and discussion (a "Zen Game"). 4th Wednesday: Community night and Zen Game. Bring your friends, significant others, children, etc. We sit in an informal way, and then share some food while we catch up on each other's lives a bit. 5th Wednesday: When this happens, we do two silent mediation periods with tea in between. Please come join us, whatever your level of experience or interest. This is an urban sangha and we aim to reflect the diversity of people and professions and orientations of our City. Whatever, whenever and however you show up is good enough. If some beginning instruction is helpful, we will weave it into the sit. We hope to sit with you soon.